The operation and configuration of data- and control-plane global application health monitors are covered in this article. As mentioned in the Avi GSLB Architecture, Terminology, and Object Model article, a GSLB service is the representation of a global application deployed at multiple sites. The corresponding GslbService configuration object defines the FQDN of the application, the backing virtual services in various sites, and the priority/ratios governing selection of a particular virtual-service at any given time. This object also defines the health-monitoring methods by which unhealthy components can be identified so that best alternatives may be selected. There are two general categories of GSLB service health monitoring: control-plane and data-plane. One or both can be applied on a per-application basis. Independent of Avi GSLB, every Avi Controller cluster routinely performs local health checks to collect the health scores and performance metrics of virtual services under its direct control. In addition, if GslbService.controller_health_status_enabled is True, active GSLB sites will also periodically query the Avi Controllers at all the other sites specified within the GSLB site configuration (both active and passive sites). From them they will fetch locally-collected health and load information. This very efficient data collection method gives insight into all Avi Vantage virtual services that participate in a global application. Note: Control-plane health monitoring does not apply to third-party load balancer VIPs or standalone servers because — by definition — there is no Avi Controller to query in those cases. To avoid cluttering the below figure with too many arrows, only the active Controller in DC1 is shown collecting health information from 3 other Controllers (dashed arrows). DC1’s Controller passes a coalesced picture of health status to its local DNS (solid arrow). In reality, the active Controllers in DC2 and AWS would behave in like fashion, updating their respective local DNS virtual services with control-plane-based health status. In contrast to control-plane-based health monitoring, no site’s Controller cluster is queried. Instead, health checks go directly to participating services, i.e., to the data plane. At an active site, an SE hosting a GSLB DNS VS can perform a variety of periodic health checks against all GSLB pool members (including the virtual services local to it). Starting with release 17.1.2, an SE can be dedicated to performing these health checks. Active monitors generate synthetic traffic from the DNS Service Engine to mark a virtual service (pool member) up or down, based on its response. 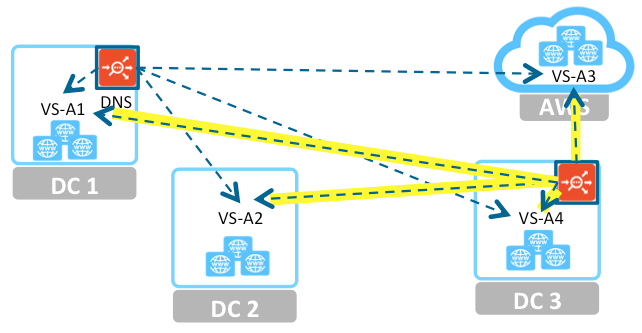 The below diagram shows the DNS in DC1 (the only active site) performing this function against its local virtual service (VS-A1), as well as VS-A2, VS-A3 and VS-A4. As previously mentioned, the object used for this is called the GslbHealthMonitor. Ping, TCP, UDP, DNS, and HTTP(S) health monitors are supported (as pictured in the Configuring Health Monitoring section below. Additionally, one can write and incorporate one’s own monitor. Please read the Health Monitoring KB for more information. This feature was added in Avi Vantage release 17.1.2. To explain localized data-plane health checking, let’s first embellish the single-DNS configuration depicted above. In the below figure, DC3 is transformed into an active site via deployment of an Avi DNS SE. 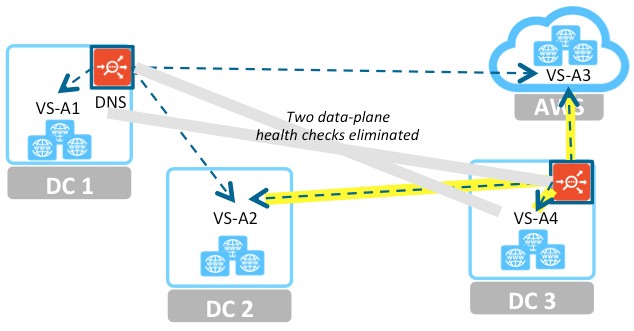 This nominally adds four additional data-plane health checks, from DC3’s Avi DNS SE to each of the four member virtual services. The firewalls protecting DC1 and DC3 have been configured to permit the Avi Controllers to communicate, but they block direct access to VS-A4 (from DC1) and to VS-A1 (from DC3). We want to scale the performance of each Avi DNS SE by minimizing the number of health checks each must perform. Since each member VS is already being data-plane checked by a local DNS, we consider it wasteful for remote DNSes to replicate those checks. We can achieve the optimization depicted in the below figure by optioning VS-A1 and VS-A4 for localized data-plane health checks. Two data-plane health checks are eliminated. Instead, each DNS SE gets the health information it needs by querying the remote site’s Avi Controller. This hybrid approach, which combines control- and data-plane health checking, is enabled for a global service on an individual member VS basis. The only restriction is that the member VS runs on an active Avi site. A GSLB site can optimize its health-checking work by identifying other GSLB sites as health-monitoring proxies to perform checks it otherwise would have to perform. In the below figure, the pulldown menu of the Health Monitor Proxy field offers three Avi GSLB sites capable of performing local checks for the GSLB being created via the GSLB site editor. GSLB_SERVICE_DOWN_RESPONSE_NONE – the default option, simply drops the request. GSLB_SERVICE_DOWN_RESPONSE_FALLBACK_IP – respond with a single preset fallback IP address, which typically would point to a server that’s serving a “sorry” page. GSLB_SERVICE_DOWN_RESPONSE_EMPTY – return an empty DNS response; can be used to make the client retry in certain cases. Control-plane health checking only – If this is desired, define no active data-plane health monitors. Have all active Controllers coalesce the health stats they collect locally with stats from remote Controllers responsible for their local GSLB pool members. Coalesced stats are then passed from each active Controller (cluster) to its local DNS. This health-checking technique is only available for members implemented as Avi Vantage virtual services. Data-plane health checking only – Set GslbService.controller_health_status_enabled to False. Have each GSLB DNS perform health checks on all GSLB member virtual services (including those hosted on external sites). Both control- and data-plane health checking – Turn both options on. For a member VS to be marked UP, both control and data health should report UP. If the control-plane health check is failing due to a remote Controller being down/inaccessible, but data-plane health checking is still possible, then it alone will determine whether a GS member VS is marked UP or DOWN. GslbService.health_monitor_scope – an optional parameter that takes on one of two states. By default, it is set to GSLB_SERVICE_HEALTH_MONITOR_ALL_MEMBERS, in which case DNS SEs actively probe pool members at both Avi and external sites. However, the parameter can be set to GSLB_SERVICE_HEALTH_MONITOR_ONLY_NON_AVI_MEMBERS, such that external member status is collected the only way possible, while the work of Avi member health checking is offloaded from DNS SEs to Avi Controllers local to the GSLB pool members. When a large fraction of GSLB sites are configured to be active, the burden on Controllers and the networks interconnecting them can be excessive. For example, consider two deployments, each with 10 Avi sites. One has 5 active Controllers, the other just 2. Each regularly scheduled remote-site health check from an active Controller collects health status from 9 remote sites. Compare the throughput consumed when 5 Controllers probe 9 sites each, versus when just 2 Controllers probe 9 sites. That’s 45 remote-site collections per unit of time compared to just 18. The latter is considerably more throughput-efficient, while still delivering reasonable GSLB DNS redundancy for HA. The below specifications apply to the GUI examples shown in this section. The customer has multiple data centers. Two global applications spanning both are going to be deployed. Each will require health monitors to be configured. view.sales.avi.local will run in US-West and rely on US-Central as a disaster recovery site. pay.sales.avi.local will run at US-West as well as US-East to achieve both high availability and optimal user experience. 1. Configure a data-plane health monitor for both GSLB services. Recall that this operation can only be performed by an authorized user logged into the GSLB leader Controller. When not satisfied with the default values for a monitor’s parameters, one can change them. However, in the case of a system-standard monitor, the better practice is to define a brand new monitor by clicking on Create. The defaults that apply will be populated into the editor window, and can then be modified as desired. Refer to the New GSLB Health Monitor editor window below. The monitor name is arbitrary; the letters “tcp” merely help us recognize it for what it is. The Type parameter is what counts. Note the other values we’ve specified for some of the parameters. Parameters above the solid line are common to all monitor types. Receive Timeout – A valid response from the server is expected within this number of seconds. It must be less than the send interval. If server status is regularly flapping between UP and DOWN, consider increasing this value. Health Monitor Port – Regardless of what port underpinning virtual services use, this monitor will direct its health checks to port 80. A monitor port is mandatory for HTTP(S), TCP, UDP and external health monitors. Is Federated? – This option helps define the object’s replication scope. If enabled, the object is replicated across the federation. Else, it is visible within the Controller-cluster and its associated service engines. is_federated is set to True only when GSLB is turned on. A federated health monitor is used for GSLB purposes while it is not applicable for a regular health-monitor. This implies that a GSLB service cannot be associated with a regular health monitor, because GSLB service is a federated object, while the health monitor is not. Conversely, A pool cannot be associated with a federated health monitor because the pool is not a federated object. Clicking on Save in the new GSLB Health Monitor editor completes the custom-monitor creation. 2. Configure the GSLB services. This operation can only be performed on the GSLB leader Controller. The New GSLB Service wizard speeds the definition of either active/active or active-standby configurations, as first introduced in the Avi GSLB Overview article. Both are illustrated below. By astutely picking GslbPool.priority values, one for each of our pools, it is possible to fashion an active/standby configuration. A pool with priority 12 will handle all traffic unless and until it fails, at which time a standby pool with priority 5 will automatically take over. Navigate to Applications > GSLB Service, click on Create and choose the Basic Setup option. Naming the new GSLB service "view- a-s" reminds administrators that this is an active/standby GSLB service. The Application Name field, which is set to "view," is more important for application users. Since this is to be a TCP service, and data-plane health checking is desired, an appropriate active health monitor to choose is "our-gslb-tcp-monitor," the health monitor previously created. The default value for Health Monitor Scope (All Members) is left alone for two reasons: (1) No external virtual services are planned, so "Only Non Avi Members" becomes irrelevant. (2) Un-clicking "All Members" would mean we set up a customer monitor for no reason. We might consider un-checking Controller Health Status option and rely only on the active monitor just enabled. From a health monitoring point of view, these fields are the most important ones in the scenario. Other fields, though likewise important, have nothing to do with health monitoring. In the Pool Member section, "Virtual Service" (the default) is appropriate, since in this example external virtual services (for which an IP address would be appropriate) are not desired. Of the various site clusters in the pulldown, "US-West" is picked. The Virtual Service pulldown reveals all existing Avi virtual services running under that Controller cluster. VS-Site-US-West is selected. The Priority field has no default value. Setting it to 12 will make this the active site simply because a lower value (5) is planned for the standby site's pool. Clicking on Save completes this step. Clicking the pencil icon in the rightmost column of the application's row shows the progress made so far (see below). Notice the default choices Avi Vantage has automatically made for the pool Name and its Algorithm (round robin, as opposed to consistent hash). Clicking Add Pool in the GSLB service editor enables addition of the standby pool. Continuing with Avi Vantage's pool-naming convention, "view a-s-pool-2" is chosen, with a priority of 5, and the default for the load-balancing algorithm. Although "US-West" is once again offered in the Site Cluster Controller pulldown, "US-Central" makes more sense. At US-Central, "VS-Site-US-Central" is the chosen virtual service. The default Ratio (1) is a "don't care" value because no additional virtual services are planned for this pool. It would matter were Add GSLB Pool Member clicked and a second virtual service identified. Clicking on Done ends this step. The GSLB service editor screen that appears (see below) reveals the progress made so far. Notice that no GSLB-service-specific values for Number of IPs returned by DNS server or TTL served by DNS Service have been specified. The DNS service's values for these will therefore apply. Clicking Save completes this step. Our two-pool active/standby GSLB service has been created. Name the new GSLB service "pay a-a," set Application Name to "pay," choose "our-gslb-tcp-monitor" from the Health Monitor pulldown, accept the default for Select Group Type, choose "US-West" for the first of the two sites, and "VS-Site-US-West" for the Virtual Service parameter. Click on Save to complete this step. The Applications list will initially show a red-circle-exclamation-point status, but after some seconds, if all is well, it will turn solid green, indicating "pay a-a" is enabled and healthy. At this point, we don't need a second pool. Instead, we need to add more virtual services to the existing pool. ["Active/active" pertains to the virtual services within the pool.] Clicking the pencil icon in the GSLB Pool section of the above screen yields the below, so that we can add a second pool member, i.e., a second virtual service. Clicking Add GSLB Pool Member above opens up a second set of pool-member fields. The below shows them completed. The Site Cluster Controller is "US-East" and the desired virtual service is "VS-Site-US-East." Leaving the Ratio values at 1 suggests that neither virtual service will be weighted over the other. Clicking on Done above returns us to the GSLB service editor (as shown below). Clicking Save completes the process. Note that an "active/active" GSLB service nominally requires only one pool. A single-pool configuration will show a value in the Priority field, but it is inconsequential. Virtual service selection within the single pool is instead a function of the algorithm (round robin in this case), tempered by the ratios, if unequal. Standby functionality can be added to the active/active “pay” application by adding a second pool with a lower priority. The below GSLB Pools section of the GSLB service editor shows a configuration that implements such an upgrade. As long as either VS-Site-US-West or VS-Site-US-East is up and not at maximum capacity, its higher priority steers all traffic toward “pay a-a-pool.” Otherwise, Avi Vantage puts “pay a-a-pool-2” to work. In case there’s an FQDN miss on a DNS virtual service, Avi can pass this request through (load-balancer) to one or more backup DNS servers. To enable this, configure a pool containing these servers, and attach this to the DNS virtual service. 5. 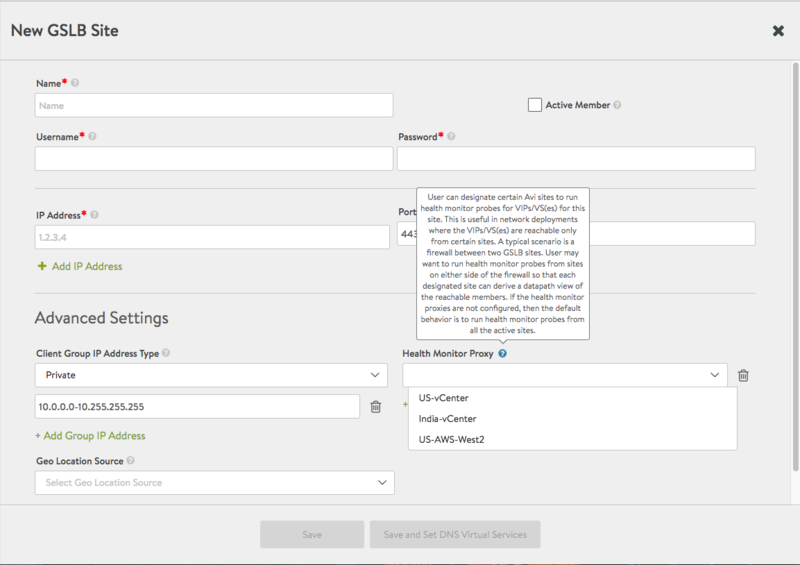 Configure corporate/external DNS server to delegate sub-domain to the Avi DNS service.